This is the first of a two-part blog post series entitled "North Carolinians and the Occupation of Europe," exploring the end of World War I and the U.S. Army of Occupation’s time in Europe from the end of November 1918 through July 1919. The posts are looking at the experiences of North Carolina military service individuals and female volunteer workers during their time on occupation duty in France and Germany, specifically. Part 1 is an introduction to the how the Army of Occupation was formed, and how the time of entrance into active military service of various North Carolina military units determined when they returned to the United States after the Armistice was declared in November 1918. One of the most common mistakes the average American makes in thinking about World War I is that when the Armistice went into place on November 11, 1918—the war ended. 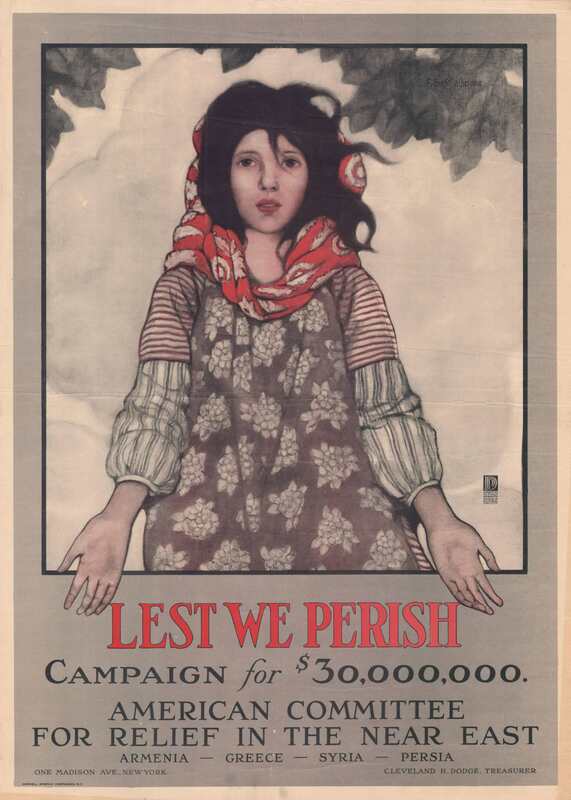 Although combat ended in western and central Europe, military conflict related to WWI was not over around the world, nor were the multiple famines occurring in connection with the war and other factors in eastern Europe and the Middle East. The Russian Revolution had upended conditions in eastern Europe, causing great uncertainties about how the Bolsheviks would be proceeding in taking over control of Russia and its sphere of influence around the Black Sea. Both the U.S. Army and U.S. Navy were put on notice that they might be involved in eastern Europe if the situation devolved, and the Navy indeed sent ships to patrol the Black Sea. Such was the experience of U.S. Navy sailor Leo H. Hardy of Beaufort County, N.C, who was assigned to the USS J. Fred Talbott (DD-156), a U.S. Navy Wickes class destroyer, which was ordered with a number of other Navy vessels to operate off the Russian coast between 1918 and 1920. They were there in support of American, British, and other Allied countries’ troops that were sent there in support of the White Russians who were fighting against the Bolsheviks as part of the 1917 Russian Revolution. The U.S. had sent 4,500 men and over 500 had been killed for this military action between September 1918 and July 1919. Hardy’s ship also went to a region then under Austria-Hungary and other ports in the Mediterranean Sea during this period. Hardy and the Talbot left from the U.S. for Mediterranean Sea port of Spalato, Dalmatia in then Austria-Hungary (modern-day Split, Croatia) around July 1919, arriving at the U.S. Naval Base in the Azores Islands, on July 16, 1919. By the fall of 1919, Hardy was stationed in Spalato aboard the J. Fred Talbot with 215 officers and sailors. By February 11, 1920, the Talbott, which had headed into the Black Sea, was docked in port at what was then Odessa, Russia (now Odessa, Ukraine). By February 16, 1920, Hardy and his ship was stationed in the port of what was then Batoum, Russia (now Batumi, Georgia) on the Black Sea. 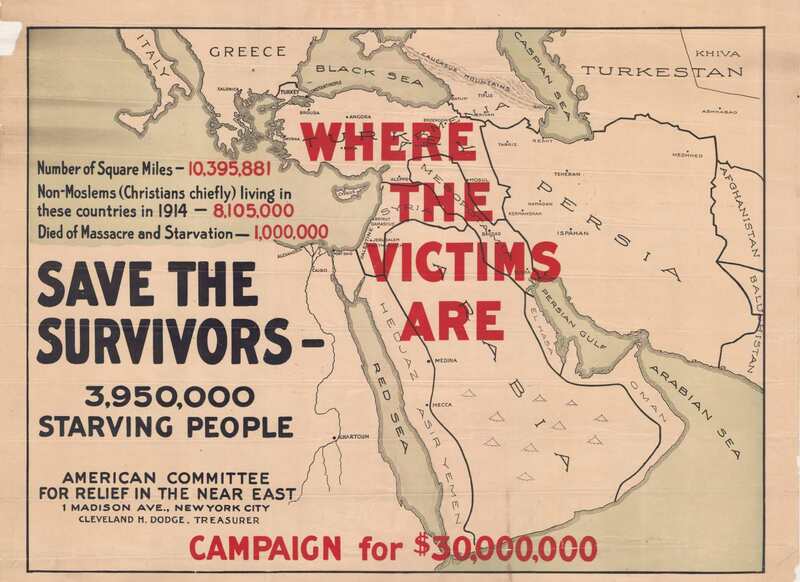 Hardy notes that the American Society for Relief in the Near East was ultimately responsible for helping to stave off a total annihilation of the Armenians in the Armenian Genocide by the Ottoman Empire during WWI, and he saw battles from the Talbott in Odessa and Batoum involving the local populations. By March 15, 1920, Hardy and the Talbott was stationed in Venice, Italy. Although he thought he would head back to the U.S. by early April 1920, Hardy was issued a job in Italy related to WWI at the end of March 1920. He was ordered to travel throughout a number of small Italian towns, gathering the bodies of American Navy sailors killed in Italy during WWI. Hardy located the bodies in wartime graves in the Italian towns, preparing them for transportation back to the U.S., aboard the USS Nereus (AC-10). Perhaps the greatest lack of understanding about the end of WWI is the amount of time that American forces remained on occupation duty in Europe after the Armistice—especially for units composed of mainly North Carolinians. Due to America’s late entrance into the war in April 1917, it would take nine months to a year of training military units before they were sent to Europe to fight. National Guard units entered the fray soonest, as they already had an agreement to serve in federal military engagements when called up from reservist duties to the National Army. North Carolina’s National Guard units went to military camps in August and September 1917, and would be the first North Carolina units to enter Europe in May-June 1918. Those North Carolinians who were drafted or enlisted after the summer of 1917 were largely—for the U.S. Army—added to the 81st Division or miscellaneous other units. The 81st Division was not formed in military camp as an organization formally until September 1917. The 81st Division did not leave for Europe until August 1918. 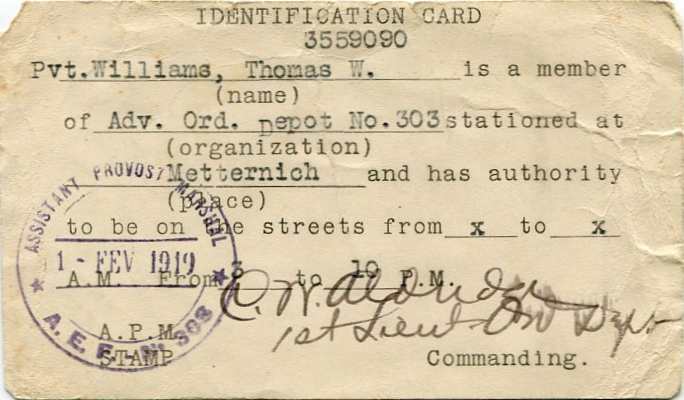 The units of the 30th Division (formally the North Carolina National Guard) remained on occupation duty in Europe through March and April 1919, when they left by transport ships back for the U.S. The other major unit to contain large numbers of North Carolinians—the 81st Division—would not leave from Europe until June and July 1919, as this division was formed later in the war. For these men, although the war was over, their military service was not. Many of these men continued to get illnesses—including the Spanish flu, get wounded by unexploded ordnance in towns and combat zones, or engaged in guarding German prisoners of war. U.S. Army Nurse Corps nurse Laura C. Doub of Moore County, N.C., would note while she was stationed at a military hospital that “At the hospital I am working in a medical ward of 100 beds, we have about 93 cases of ‘flue’—I certainly hope there is not going to be another epidemic. Some of our boys are very sick now. One died in the pneumonia ward yesterday and somehow it seems harder to have them die now of disease than to have been shot during the war” [Laura C. Doub, letter, dated February 15, 1919]. The idea of “war service” for these men meant more than just combat, and their war would not be over until the summer of 1919. “In accordance with the terms of the Armistice, the Allies were to occupy all German territory west of the Rhine, with bridgeheads of 30 kilometers radius at Cologne, Coblenz, and Mayence [or Mainz], Germany. The zone assigned the American command was the bridgehead of Coblenz and the district of Treves. This territory was to be occupied by an American Army, with its reserves held between the Moselle-Meuse Rivers and the Luxemburg frontier. The instructions of French Field Marshal Foch, issued on November 16, 1918, contemplated that two French infantry divisions and one French cavalry division would be added to the American forces that occupied the Coblenz bridgehead, and that one American division would be added to the French force occupying the Mayence bridgehead. As this arrangement presented possibilities of misunderstanding due to difference of views regarding the government of occupied territory, it was represented to the marshal that each nation should be given a well-defined territory of occupation, employing within such territory only the troops of the commander responsible for the particular zone. Various reasons made it undesirable to employ either the First or Second U.S. Army as the U.S. Army of Occupation. Plans had been made before the Armistice to organize a Third Army and, on November 14, 1918, this army, with Maj. Gen. Joseph T. Dickman as commander, was designated as the army of occupation. The Third and Fourth Army Corps staffs and troops, less artillery, the 1st, 2nd, 3rd, 4th, 32nd, and 42nd Divisions, and the 66th Field Artillery Brigade were assigned to the Third Army. This force was later increased by the addition of the Seventh Corps, Maj. Gen. William M. Wright commanding, with the 5th, 89th, and 90th Divisions. Headquarters of the Third Army was first located at Ligny-en-Barrois, France; that of the Third Corps at Dun-sur-Meuse, France; and that of the Fourth Corps at Woinville, France.” [The Medical Department of the United States Army in the World War, Volume VIII: Field Operations (Washington: Government Printing Office, 1925)]. Many of the American soldiers had hoped to be home by Christmas 1918. But, that was not to be for the majority of them on occupation duties or in military hospitals recovering. They would Christmas together, trying to make the best of the situation. 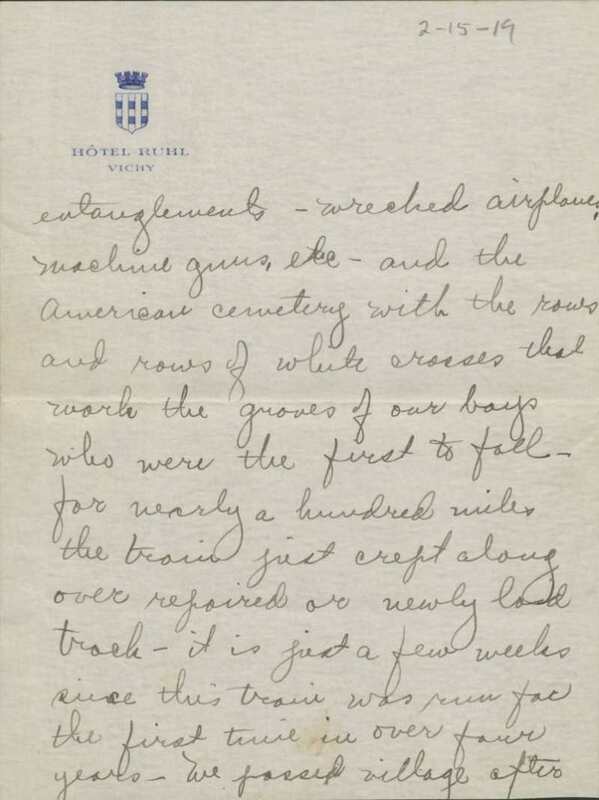 Army nurse Laura Doub wrote while stationed at a military hospital in December 1918, about their efforts to raise the Christmas spirt for the men: “We had the regulars, all of them, a Christmas tree with all decorations, Santa sitting on the tip-top, there was a sock for every patient, and a red cornucopia with cigarette, matches and fudge we had made in there. . . [December 25]. Got up at 4:30 to help sing carols in the wards at 5 [A.M.]—there were about 150 of us—each carrying a candle, walking two by two—it really sounded good and looked pretty, we sang all old Christmas hymns ‘Come All Ye Faithful,’ ‘Holy Night,’ ‘Little Town of Bethlehem,’ etc. I saw some of the men crying and I cried a little too" [December 27] [Laura C. Doub, letters home, December 25 and 27, 1918]. 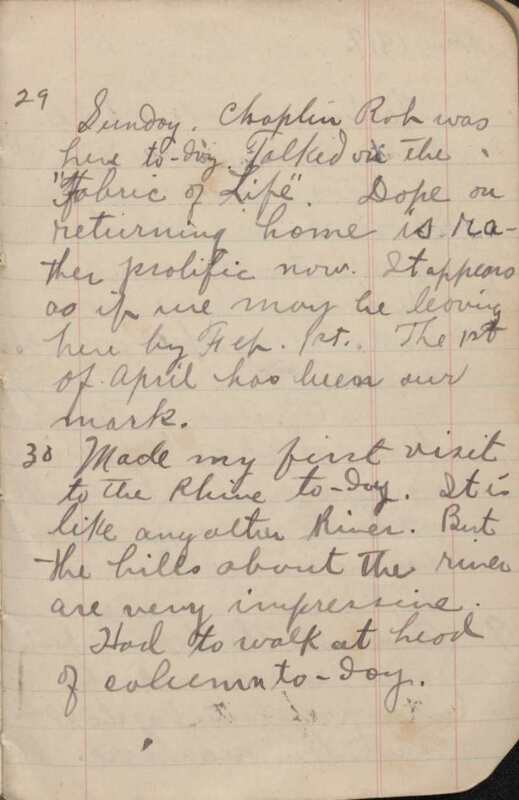 Army nurse Laura Doub wrote home on February 15, 1919, from Germany about her experiences seeing the battlefields in France for the first time: “Monday morning we left Paris and reached Metz at 7 pm. We stopped at Chateau Thierry long enough to see all we wanted to of that shell-tortured town—saw the trenches, barbed wire entanglements, wretched airplanes, machine guns, etc.—and the American cemetery with the rows and rows of white crosses that mark the graves of our boys who were the first to fall—for nearly a hundred miles the train just crept along over repaired or newly laid track—it is just a few weeks since this train was run for the first time in over four years—we passed village after village and some very large towns shot all to pieces—nothing for miles but waste, wreckage, devastation- how humbly we realized the real waste of war.” Such was the common experience for Americans on occupation duty, watching the rotting corpses of their Allied colleagues on battlefields they marched past, watching starving villagers in France and Germany beg for food, and going without seeing trees or much greenery for months as they were destroyed by fighting. You can read the second part of this blog post series, entitled “North Carolinians and the Occupation of Europe, Part 2,” through this link. All quotes from letters and diaries were taken from original archival materials held in the WWI Papers of the Military Collection and the Private Collections at the State Archives of North Carolina, Raleigh, N.C. The Medical Department of the United States Army in the World War, Volume VIII: Field Operations, Section VII—American Expeditionary Activities in Germany, Italy, North Russia, and Siberia; Chapter XXXVIII—The Advance into Germany, Page 895 (Washington: Government Printing Office, 1925).